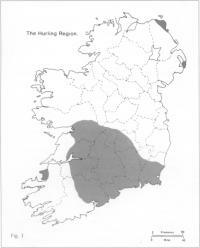 The second version of the game (iomán or báire) was of southern provenance. The ball could be handled or carried on the hurl, which was flat and round-headed; the ball (the sliothar) was soft and made of animal hair; the game was played in summer. Unlike commons, this form of hurling was patronised by the gentry, as a spectator and gambling sport, associated with fairs and other public gatherings, and involved a much greater degree of organisation (including advertising) than the more demotic ‘commons’. A 1742 advertisement for Ballyspellan Spa in Kilkenny noted that ‘horse racing, dancing and hurling will be provided for the pleasure of the quality at the spa’. A number of factors determined the distribution of the southern game. (Fig. 2) The most important was the patronage of local gentry families, particularly those most closely embedded in the life of the local people. (Table 1) They picked the teams, arranged the hurling greens and supervised the matches, which were frequently organised as gambling events. The southern hurling zone coincides with the area where, in the late medieval period, the Norman and Gaelic worlds fused to produce a vigorous culture, reflected, for example, in the towerhouse as an architectural innovation. It coincides with well-drained, level terrain, seldom moving too far off the dry sod of limestone areas, which also happen to produce the best material for hurls – ash. It is closely linked to the distribution of big farms, where the relatively comfortable lifestyle afforded the leisure to pursue the sport. A hurling match is a scene of drunkenness, blasphemy and all kinds and manner of debauchery and faith, for my part, I would liken it to nothing else but to the idea I form of the Stygian regions where the daemonic inhabitants delight in torturing and afflicting each other. By the mid nineteenth century, hurling had declined so steeply that it survived only in three pockets, around Cork city, in south-east Galway and in the area north of Wexford town. Amongst the reasons for decline were the withdrawal of gentry patronage in an age of political turbulence, sabbitudinarianism, modernisation and the dislocating impact of the Famine. Landlord, priest and magistrate all turned against the game. The older ‘moral economy’, which had linked landlord and tenant in bonds of patronage and deference, gave way to a sharper, adversarial relationship, especially in the 1790s, as the impact of the French Revolution in Ireland created a greater class-consciousness. Politicisation led to a growing anti-landlord feeling, which had been far more subdued in the heyday of gentry-sponsored hurling between the 1740s and 1760s. The model of élite participation in popular culture is a threefold process: first immersion, then withdrawal, and, finally rediscovery, invariably by an educated élite, and often with a nationalist agenda. ‘Rediscovery’ usually involves an invention of tradition, creating a packaged, homogenised and often false version of an idealised popular culture – as, for example, in the cult of the Highland kilt. The relationship of hurling and the newly established Gaelic Athletic Association in the 1880s shows this third phase with textbook clarity. Thus, when Michael Cusack set about reviving the game, he codified a synthetic version, principally modelled on the southern ‘iomán’ version that he had known as a child in Clare. Not surprisingly, this new game never caught on in the old ‘commons’ area, with the Glens of Antrim being the only major exception. Cusack and his GAA backers also wished to use the game as a nationalising idiom, a symbolic language of identity filling the void created by the speed of anglicisation. It had therefore to be sharply fenced off in organisational terms from competing ‘anglicised’ sports like cricket, soccer and rugby. Thus, from the beginning, the revived game had a nationalist veneer, its rules of association bristling like a porcupine with protective nationalist quills on which its perceived opponents would have to impale themselves. Its principal backers were those already active in the nationalist political culture of the time, classically the I.R.B. Its spread depended on the active support of an increasingly nationalist Catholic middle class – and as in every country concerned with the invention of tradition, its social constituency included especially journalists, publicans, schoolteachers, clerks, artisans and clerics. 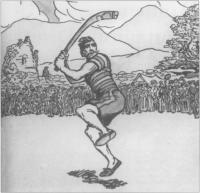 Thus, hurling’s early success was in south Leinster and east Munster, the very region which pioneered popular Irish nationalist politics – from the O’Connell campaign, to the devotional revolution in Irish Catholicism, from Fr. Matthews’ temperance campaign, to the Fenians, to the take-over of local government. The GAA was a classic example of the radical conservatism of this region - conservative in its ethos and ideology, radical in its techniques of organisation and mobilisation. The spread of hurling can be very closely matched to the spread of other radical conservative movements of this period – the diffusion of the indigenous Catholic teaching orders and the spread of co-operative dairying. It would, however, be a mistake to see the spread of hurling under the aegis of the GAA solely in nationalist terms. The codification and success of gaelic games should be compared to the almost contemporaneous success in Britain of codified versions of soccer and rugby. All these were linked to rising spending power, a shortened working week (and the associated development of the ‘weekend’), improved and cheaper mass transport facilities which made spectator sports viable, expanded leisure time, the desire for organised sport among the working classes, and the commercialisation of leisure itself. The really distinctive feature of the GAA’s success was that it occurred in what was still a predominantly agrarian society. That success rested on the shrewd application of the principle of territoriality. If neighbours were playing like New Ross and Tullogher, there would be a real needle in it. When Carrickshock were playing, I once heard an old man shouting ‘come on the men that bate the tithe proctors’ and there was a tremor and real fervour in his voice. It was a battle cry, with hurleys as the swords, but with the same intensity. Someone struck the big drum a single blow, as if by accident and, turning round quickly, the thatched roofs of the hamlet caught his eye. And, strange to say, those old mud walls and thatched roofs roused him as nothing else could. His breast heaved, as with glistening eyes, and that soft plaintive smile of his, he uttered the words, ‘For the credit of the little village!’ in a tone of the deepest tenderness. Then, grasping the sledge in his right hand, and drawing himself up to his full height, he measured the captain’s cast with his eye. The muscles of his arms seemed to start out like cords of steel as he wheeled slowly round and shot the ponderous hammer through the air. His eyes dilated as, with quivering nostrils, he watched its flight, till it fell so far beyond the best mark that even he himself started with astonishment. Then a shout of exultation burst from the excited throng; hands were convulsively grasped, and hats sent flying in the air; and in their wild joy they crushed around him and tried to lift him upon their shoulders. 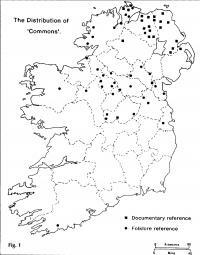 The territorial allegiance and communal spirit celebrated and idealised by Kickham have died hard in Ireland. GAA club colours, for example were often drawn from old faction favours and, even now, an occasional faction slogan can still be heard. ‘If any man can, an Alley man can’. ‘Squeeze ‘em up Moycarkey and hang ‘em out to dry!’ Lingering animosities can sometimes surface in surprising ways: it is not unknown, for example, for an irate and disappointed Wexford hurling supporter (and what other kind of Wexford supporter is there?) to hurl abuse at Kilkenny, recalling an incident that occurred in Castlecomer to indignant Wexford United Irishmen: ‘Sure what good are they anyway? Didn’t they piss on the powder in ‘98?’ A possibly apocryphal incident occurred after a fiercely contested Cork-Tipperary match. Cork won but in Tipperary eyes that was solely due to a biased Limerick referee. When the disgruntled Tipperary supporters poured off the train at Thurles, they vented their frustrations on the only Limerick man they could find in the town – by tarring and feathering the statue of Archbishop Croke in the Square (presumably the only time in Irish history that a Catholic bishop has been tarred and feathered). At home we played soccer in the street and sometimes a version of hurling, fast and sometimes savage, adapted from the long-pucking grace of Kilkenny and Tipperary to the crookeder, foreshortened, snappier brutality of the confines of a slum thoroughfare. If one looks at the present hurling core region, it is remarkably compact. It also exhibits striking continuity with the earlier ‘iomán’ region. (Fig. 3) The hurling heartland is focused on the three counties of Cork, Tipperary and Kilkenny, with a supporting cast of adjacent counties – Limerick, Clare, Galway, Offaly, Laois, Waterford and Wexford. In the hurling core, the game is king, and very closely stitched into the fabric of the community. Describing the situation in Rathnure, Billy Rackard claimed that in the absence of hurling, ‘the parish would commit suicide, if a parish could commit suicide!’ The boundaries of the hurling region are surprisingly well-defined. To the north, the midland bogs act, as in a way they have done throughout history, as a buffer zone, resolutely impervious to the spread of cultural influences from further south. The western edge of the hurling zone can be traced over a long distance. In County Galway, for example, its boundaries run along a line from Ballinasloe to the city; north of this line is the Tuam-Dunmore area, and west of it is Connemara, both footballing territories. In County Clare, the boundary runs from Tubber on the Galway border through Corofin and Kilmaley to Labasheeda on the Shannon estuary. Last summer, the tremendous achievement of Clare in winning a Munster football championship was most thoroughly relished in the footballing bastion of west Clare, from Kilkee and Doonbeg to Milltown Malbay. One could easily establish this pattern by looking at the thickening density of the forest of flags as one drove from east to west in August. kingdom of Kerry in the area north of Tralee, in Ardfert, Bally heigue, Causeway and Ballyduff. From Limerick, the hurling boundary loops through County Cork from Mallow to the city and then to the coast at Cloyne – home to the maestro Christy Ring, who famously expressed his strategy for promoting the game in Cork – by stabbing a knife through every football found east of that line. Outside this core region, there are only the hurling enclaves in the Glens of Antrim and on the tip of the Ards peninsula, where the clubs of Ballycran, Ballygalget and Portaferry backbone Down’s hurling revival. The interesting question then is how these boundaries formed. In almost every case, that boundary divides big farm and small farm areas and marks the transition from fertile, drift-covered limestone lowland to hillier, hungrier, wetter shales, flagstones, grits and granites. In County Galway, for example, hurling has not put down roots in the bony granite outcrops of Connemara, and in Clare the poorly drained flagstone deposits are equally inhospitable. If ash is emblematic of hurling areas, the rush is the distinctive symbol of football territory. This brief case study illustrates the interplay of what the French call la longue durée – the long evolution of history – and les évenements – the specific, precise incidents and personalities which intervene and alter that evolution. Hurling offers a classic Irish example, and the current game demonstrates that, beneath the superficial breaks, fractures and discontinuities, there are sometimes surprisingly stable, deep structures. If the idiom of the game has changed, its grammar stays the same. Kevin Whelan is a Bicentennial Research Fellow at the Royal Irish Academy.